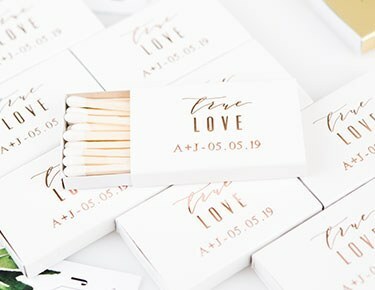 Send your guests home with something they'll cherish forever with Weddingstar's unique collection of personalized wedding favors. We've made it easy to narrow down our huge selection so that you can find a wedding favor that beautifully coordinates with your theme. Shop by type including edible favors, flower vase & container favors, personalized playing card favors, glass container favors, favor frames and much more. As for themes, the sky's the limit! Whether your wedding theme is classic, industrial, rustic, fairytale, seasonal or bohemian, our glamorous wedding favors will delight your guests and give them lasting keepsakes. Vintage favors include personalized mason jars, candy jars, vintage items like typewriters, bottle openers, antique books, antique keys and vintage vases. Nature lovers should check out our bird, butterfly, plant and animal favors. Popular wedding favor ideas include gifts that match the season of your nuptials, whether it's something floral for the spring, summer beach gear, autumnal rustic housewares or winter antlers and snowflake designs. 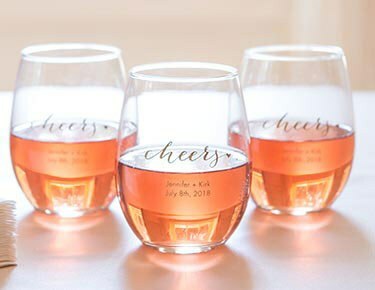 We have everything from extra-special personalized glassware that guests can toast you with all night to quirky novelty wedding favors — like miniature garden gnomes and rubber duckies — that are made to celebrate your sense of humor. And some of our most delightful selections you won't find anywhere else, like personalized foil-stamped playing card decks or elegant gold compasses that look gorgeous with Wanderlust ribbon looped around them. 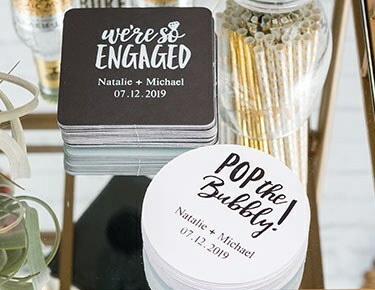 With bulk pricing and volume discounts available plus plenty of options for personalization, Weddingstar is the best place to find thoughtful, memorable and unique favors for any event you're planning. Personalized matchbooks, for example, make great favors for anniversaries and baby showers when they're paired with fine cigars or elegant candles. And with themed logos that include a simple anchor silhouette and "Hello New Year," you're sure to find a personalization choice that adds the finishing touch to any celebration — one your guests will use and remember long after the last toast is made. Our list of thoughtful, practical party favors is almost endless. Make sure your guests always remember your special day with one of our magnet wedding favors or bottle opener wedding favors. 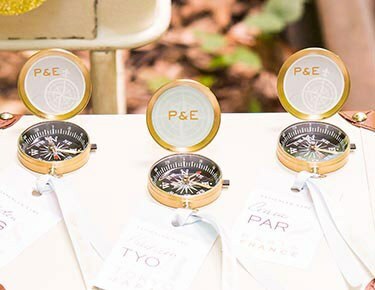 Our selection of wedding magnet favors includes fun framed styles that you can use to add an extra layer of personalization, plus every possible style from adorable sailboats and ship's wheels — a great choice for any nautical-themed event — to glittering diamonds and vintage typewriters. We also have a great selection of keychain favors that you can be sure your guests will use for the long-term with options that celebrate beachy, trendy, vintage and glamorous themes. Weddingstar also specializes in offering tasty edible wedding favors including personalized chocolates that are elegantly wrapped to suit your special theme. Whether they are strewn on a beautifully set table or tucked into gift baskets or sweet drawstring gift bags, your guests will savor the indulgence and appreciate your good taste. For extra-special pint-sized wedding favors, kids and grown-ups alike will adore our miniature gumball machines that can be ordered with or without classic Dubble Bubble gumballs. For a great way to tie your wedding favors together, explore our selection of wedding favor stationery that includes sweet favour tags, stickers and accents for a smashing finishing touch. Weddingstar has everything you need to design and execute your favors from the ground up. And with free shipping on all North American orders over $99, you can indulge in all the fine details you want without breaking your budget.